So thankful for this help in making sure I’m keeping memories for my kids in one place. I absolutely would not be doing it without the help and reminders of the texts! Thank you! 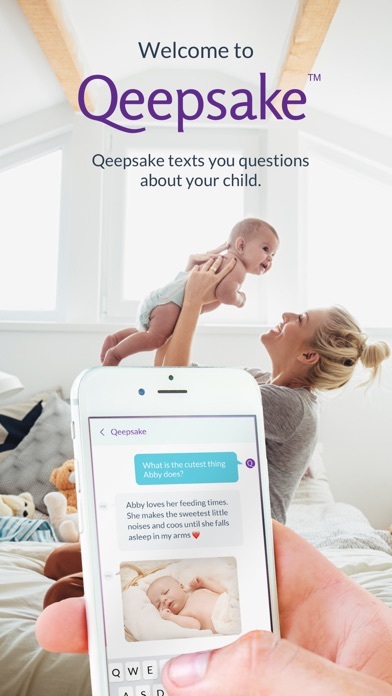 I learned of Qeepsake on SharkTank. I absolutely love this app! 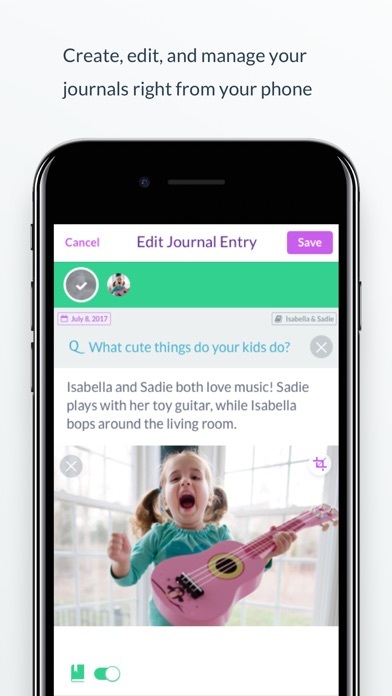 Logging entries about your child could not be easier or more convenient. Concept good but questions not easy to answer. Great idea, but questions can be more relevant to daily age period (e.g. not ideal now to ask about what I thought about when I was pregnant... having mom brain now does not help with memory). Also wish they had an option for more questions with easy 1 word answers. ;) Perhaps have the super busy mom version that is easier to answer (even if that sacrifices some personalized memories I would still want to capture milestones!). Texting not ideal for long entry answers. Cancelled because disappointed with every question. For my first kid I was really good about making her baby book, and filling in all her milestones and doing the entries that were already in the book. And for my second child I’ve kept up fairly well but I’m looking at old pictures of my first and forgetting the stories around them. It’s the daily anecdotes that this app really does amazing with. The daily questions allow you to keep memories in real time. Because we always forget the stuff we think we’re going to remember and time flies by so fast. I love using this app for my boys. However I feel like for my 16 month old, the questions are too much of the same over and over. I’d love some more variety. There seems to more variety in the questions for my 4 year old. UPDATE: I received my book. I’m glad to have all of her memories in one place, however the book is so cheap and flimsy. Especially when I have paid $115. It is flimsier than most paperback books, and I don’t think it will probably last very long with us looking through and reading the memories. :( I love that I can type memories/journal entries in Qeepsake at any time. I’ve enjoyed the questions and the app works pretty well. BUT I just went to place an order for the book (I’ve been doing a couple entries per week for my daughters first year) and the book is $170 for hardcover and $94 for a softcover. That is CRAZY! Almost $100 for a softcover book that I can’t even really customize? For example, there are some pages with just one question/response and no picture, and it takes up the entire page because they enlarged the text to a huge font. I would much rather have that small response show up on another page. On top of the crazy price, they charge $15 for shipping. $15 to ship a softcover book? I put so much energy into writing responses all year for my daughter’s first year, and I feel so disappointed that the book is going to cost so much. Questions are repetitive and a little ridiculous at times. I started with the free version. The questions were actually ones I wanted to answer and add to the journal. Not so much now that I’m getting them twice a day. I still love that I can add photos or comments whenever I’d like though. Overall a great app. I’m thankful for this appt. Such a great idea. Texting is a life saver. Looking forward to some improvements though. I would really love to send Multi pictures at a time, similar to Facebook. Also I would be ok with getting asked SOME of the same questions over again is it were 6 months to a year later, but I have only been signed up with the app for 2 months. For instance I was asked, “What games does your daughter like to play?”. And I answer with what she plays with Dad, then with Mom etc. Then, like a week later, I was asked, “ What games does your daughter like to play WITH YOU?”. And I’ve been asked at least 3 times, “Has your daughter learned anything new recently?”. Which I would understand if she were younger, but she is six. MAYBE once a month would be the most. So more variety is needed. 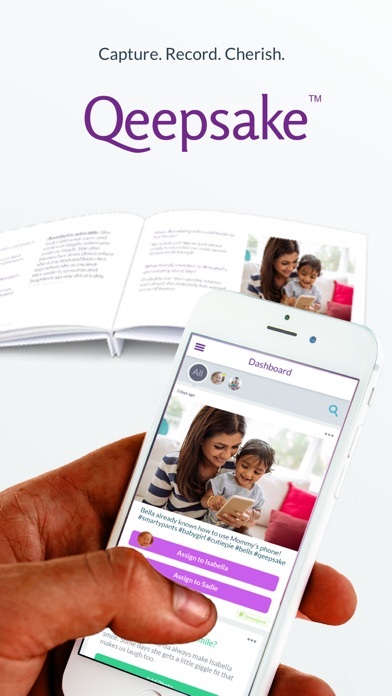 I am a working mother and originally downloaded this app to help me remember those short interactions I get with my son. At first I loved this app because it did just that, but the more I use it the more I receive questions that are for a stay at home mom, which is frustrating when I’m not at home with him to experience the things it asks about. Not only that but there seems to be limited questions. I get asked the same question 3-4 times a month. I know the app claims that they update the questions based on your child’s age, but I haven’t seen it. I would say that this app is a good place to start, but I feel that it would require more work on my part to take the data they collected and put it in to something that would be meaningful for my son in the future. By far the most I have done in any baby book and this is my 3rd baby! The app makes it easy to update or add things effortlessly.